Hogue & Hogue, LLP, has a well-earned reputation as one of the finest criminal defense firms in Georgia. That reputation was built by hard work, academic excellence, and vigorous advocacy. 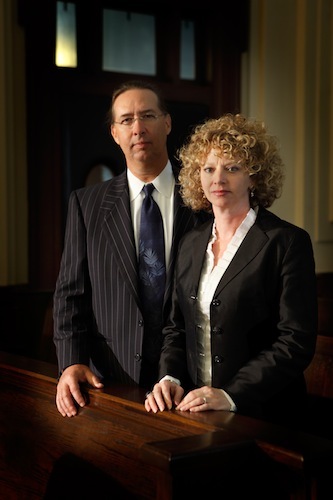 The partners at Hogue & Hogue, Franklin J. and Laura D. Hogue, have received numerous awards and recognitions for their legal victories, their creative lawyering, their compassionate representation, and the zealous advocacy that they provide to the many clients that they have represented. They have been selected by their peers as attorneys of excellence, listed among Georgia's Elite by Georgia Trend Magazine, Super Lawyers, and the Top Attorney’s in Georgia by Atlanta Magazine, the preeminent rating for legal skill and ethics by their peers in Martindale-Hubble, and other awards. Frank and Laura, a husband and wife partnership, have represented clients in nearly every county in the Middle Georgia area, in cases arising out of Macon, Warner Robins, Perry, Gray, Milledgeville, Jeffersonville, Cochran, Eastman, Forsyth, Jackson, Hawkinsville, Fort Valley, Dublin, Cordele, Griffin, McDonough, Fayetteville, Columbus, Athens, Albany, and Valdosta. It has been their privilege to defend those accused of petty crimes, such as misdemeanor marijuana possession, to major capital offenses, such as murder. Their experience includes both state and federal court and spans every type of criminal matter, from drug distribution to income tax fraud to violent crimes. If you would like to discuss your case, or that of a loved one who needs representation, please call for an appointment. There is no charge for a consultation to discuss your case. And, of course, all conversations are confidential.